Archibald Hamilton Snr. 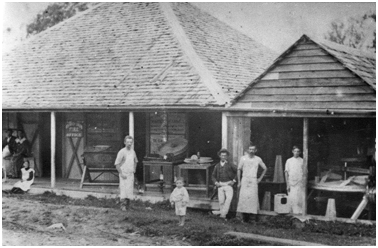 (1807-1889) opened a general store and accommodation house on Sub. 1 of Portion 28 (on the south-eastern corner of River Street and Old Dayboro Road) in 1882. 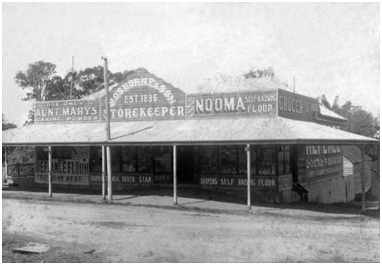 Although Hamilton died on 20 February 1889, causing the immediate closure of the business, a general store, most commonly remembered as Osborne’s Store, was to remain at or near this site until the mid 1930s. Thomas Henry Ware, butter churn and dairy utensil manufacturer and importer, 1895. Initially, however, Hamilton’s buildings appear to have been rented from 1892 to 1901 by Thomas Henry Ware (1861-1915), a carpenter, butter churn and dairy utensil manufacturer and importer. Ware and his family lived in part of the premises, using the remainder for a workroom. Here he was able to expand his business and later to erect a small workshop at the side of his shop. Employing additional men to assist in the business, he made a wide range of wooden dairy utensils under the registered brand name of ‘Devon’. As the demand for commercial-sized equipment increased, this workshop became too small for his needs and, in 1901, he moved to a factory in Annerley Road, South Brisbane. With the help of his wife, Christina (1875-1946), Archibald Hamilton Jnr. (1867-1941), a watchmaker, opened a general store in a new building in 1896. According to the reminiscences of Jim Ebert, Mrs. Christina Hamilton ran the store at the turn of the century and it is likely that Archibald Jnr. carried on his trade as a watchmaker. Various records indicate that the Hamiltons continued to operate the business until 1911. Along with groceries, the store sold a wide range of farming necessities to supply the farms in the surrounding district. From 1911 until the mid 1920s the business was owned and run by various members of the family of William Osborne (1857-1913). In 1924 the property, then owned by Annie Jane Osborne, William’s widow, was sold to Annie Leis, the wife of Owen Leis, but ownership of the general store business changed hands several times: the proprietors included Alexander Kenneth Herschel (from 1924), S. H. Pollard (from 1926) and Stan (Stanley Hope) Osborne. From late 1930 it was briefly operated by the Senyard brothers; Joseph Charles and George Frederick. It was sold to Nelson Marshall Cooke (1904-1963) in 1933 and run by him and his wife Philomena Mary (nee Kenway) until 1936, at which time the business was transferred from this store to new premises at the newly created ‘Cooke’s Corner’.